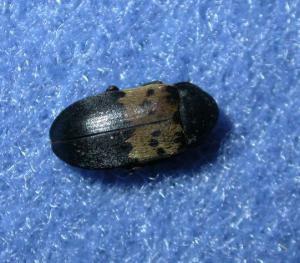 The larder beetle is a very common and widespread household insect pest. The insect's name comes from it's presence in dried, cured meats stored at room temperature prior to refrigeration. Today, larder beetles may be a pest in stored foods and other items of high protein content. Larder beetles outdoors are valuable “recyclers” that play an important role in the breakdown and recycling of animal protein. The larder beetle adult is slightly longer than 1/4th inch. It is roundly oval and dark brown to black with a characteristic light colored band running across the body. This light band contains 6 more or less prominent dark spots. 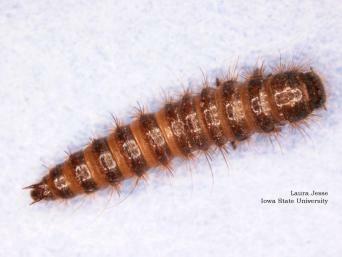 Larder beetle larvae are up to 1/2 inch long. They are tapered in shape and covered with sparse, stiff hair. There are 2 upward curved spines on the posterior end. Both the larvae and adults feed on items such as fur, hair, hides, feathers, and occasionally stored products such as dried fish, pet food and cheese. In the house, however, the most likely source is dead insects or other animals (boxelder bugs, attic flies, mice, etc.) that have accumulated inside walls or attics. If a source of larder beetles can be determined than control can be achieved by discarding or cleaning infested woolens, feathers, furs, hides and so forth. However, in the more typical, general infestation the source is probably the dead insects within the innerwall spaces and removal or sanitation is not practical. Cleaning is still recommended. Thoroughly vacuum clean cracks and crevices in the areas where larder beetles are found. A residual insecticide treatment can be applied following cleaning. Apply small quantities of residual spray or dust to cracks and edges in areas where beetles or larvae are most commonly seen. For information on insecticides please see this article.